The decision was announced by the Congregation for the Doctrine of the Faith in a ‘Letter to the Bishops’ dated 1 August and signed by the Prefect, Cardinal Luis Francisco Ladaria. 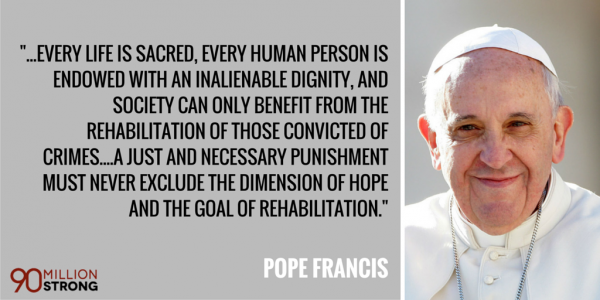 Consequently, the Church teaches, in the light of the Gospel, that “the death penalty is inadmissible because it is an attack on the inviolability and dignity of the person”, and she works with determination for its abolition worldwide”. FRANCIS, Address to Participants in the Meeting organized by the Pontifical Council for the Promotion of the New Evangelization, 11 October 2017: L’Osservatore Romano, 13 October 2017. 2267. Assuming that the guilty party's identity and responsibility have been fully determined, the traditional teaching of the Church does not exclude recourse to the death penalty, if this is the only possible way of effectively defending human lives against the unjust aggressor. If, however, non-lethal means are sufficient to defend and protect people's safety from the aggressor, authority will limit itself to such means, as these are more in keeping with the concrete conditions of the common good and more in conformity to the dignity of the human person. In the Letter to the Bishops Cardinal Ladaria explained that the revision of n. 2267 of the CCC “expresses an authentic development of doctrine that is not in contradiction with the prior teachings of the Magisterium” and said “these teachings, in fact, can be explained in the light of the primary responsibility of the public authority to protect the common good in a social context in which the penal sanctions were understood differently, and had developed in an environment in which it was more difficult to guarantee that the criminal could not repeat his crime”. Ladaria recalled that John Paul II asked that the teaching on the death penalty be reformulated to better reflect the development of the doctrine that centers on the clearer awareness of the Church for the respect due to every human life affirming that “Not even a murderer loses his personal dignity, and God himself pledges to guarantee this.” Ladaria said that in many occasions John Paul II intervened for the elimination of capital punishment describing it as “cruel and unnecessary. The new revision of number 2267 of CCC approved by Pope Francis, Ladaria said, !situates itself in continuity with the preceding Magisterium while bringing forth a coherent development of Catholic doctrine” taking into account the new understanding of penal sanctions applied by the modern State”. Its new revision, he continued, “desires to give energy to a movement towards a decisive commitment to favor a mentality that recognizes the dignity of every human life and, in respectful dialogue with civil authorities, to encourage the creation of conditions that allow for the elimination of the death penalty where it is still in effect”.